1/2"" id="2172" onclick="document.getElementById('radio-2172').checked=true;validateValues(document.add,1);selectOption(document.getElementById('radio-2172'));"> White - 24" x 24" x 4" > 1/2"
1/2"" id="2173" onclick="document.getElementById('radio-2173').checked=true;validateValues(document.add,1);selectOption(document.getElementById('radio-2173'));"> Blue - 24" x 24" x 4" > 1/2"
1/2"" id="2174" onclick="document.getElementById('radio-2174').checked=true;validateValues(document.add,1);selectOption(document.getElementById('radio-2174'));"> Blue - 24" x 24" x 7 1/2" > 1/2"
1/2"" id="2175" onclick="document.getElementById('radio-2175').checked=true;validateValues(document.add,1);selectOption(document.getElementById('radio-2175'));"> White - 24" x 24" x 7 1/2" > 1/2"
1/2"" id="2176" onclick="document.getElementById('radio-2176').checked=true;validateValues(document.add,1);selectOption(document.getElementById('radio-2176'));"> Blue - 24" x 24" x 10" > 1/2"
1/2"" id="2177" onclick="document.getElementById('radio-2177').checked=true;validateValues(document.add,1);selectOption(document.getElementById('radio-2177'));"> White - 24" x 24" x 10" > 1/2"
1/2"" id="2178" onclick="document.getElementById('radio-2178').checked=true;validateValues(document.add,1);selectOption(document.getElementById('radio-2178'));"> Blue - 24" x 24" x 12" > 1/2"
1/2"" id="2179" onclick="document.getElementById('radio-2179').checked=true;validateValues(document.add,1);selectOption(document.getElementById('radio-2179'));"> White - 24" x 24" x 12" > 1/2"
1/2"" id="2180" onclick="document.getElementById('radio-2180').checked=true;validateValues(document.add,1);selectOption(document.getElementById('radio-2180'));"> White - 32" x 26" x 5" > 1/2"
The Bed Wedge made by Hermell is designed to provide comfort and relaxation for individuals suffering from respiratory problems or lower extremity discomfort. 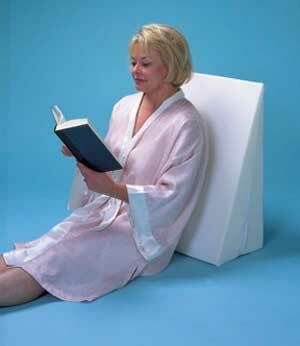 Bed wedges can also be used to support your back while sitting upright in the bed. 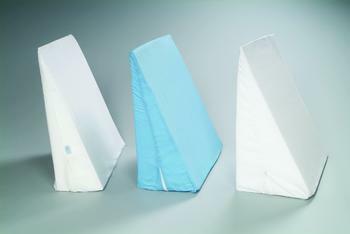 Wedge comes with a removable, zippered, machine-washable cover with additional replacement covers available. Various sizes available. Available in blue or white.